It seems as I march towards making this place into a habitable dwelling – the photos just don’t seem that interesting. 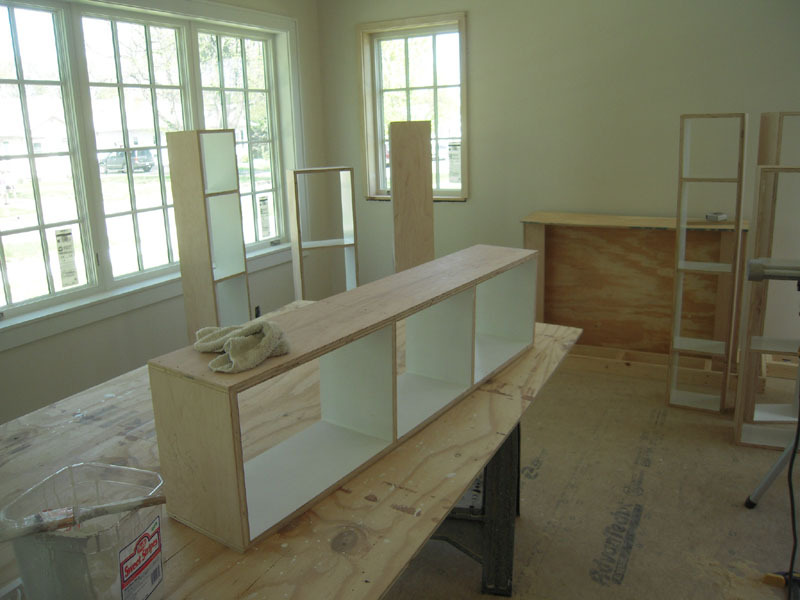 I know the good stuff is right around the corner, but it’s hard to grab a camera and take a picture of so many ho-hum projects. So here’s what happening now at the Misadventures project. 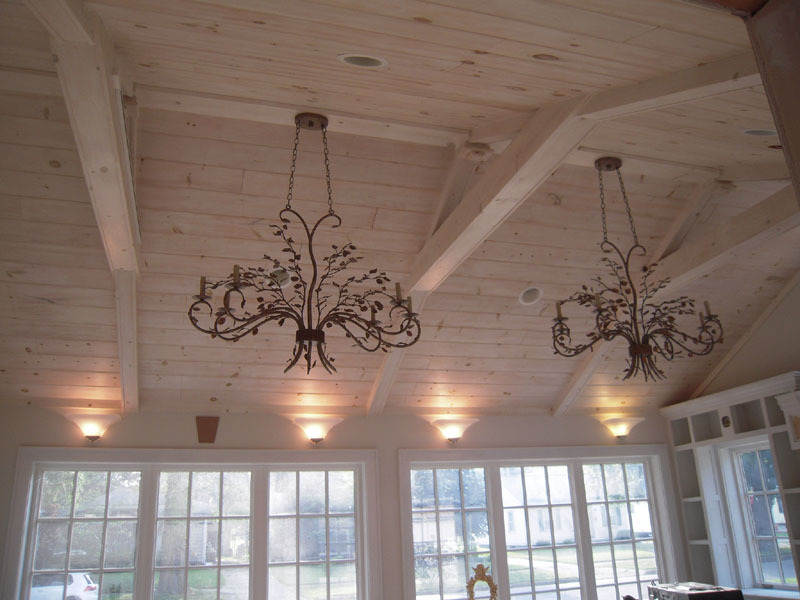 I left off with these sunroom lights installed because I needed the space in the garage. I was worried the scale might be too large, but they fit between the beams fine. You will see my problem in the background. 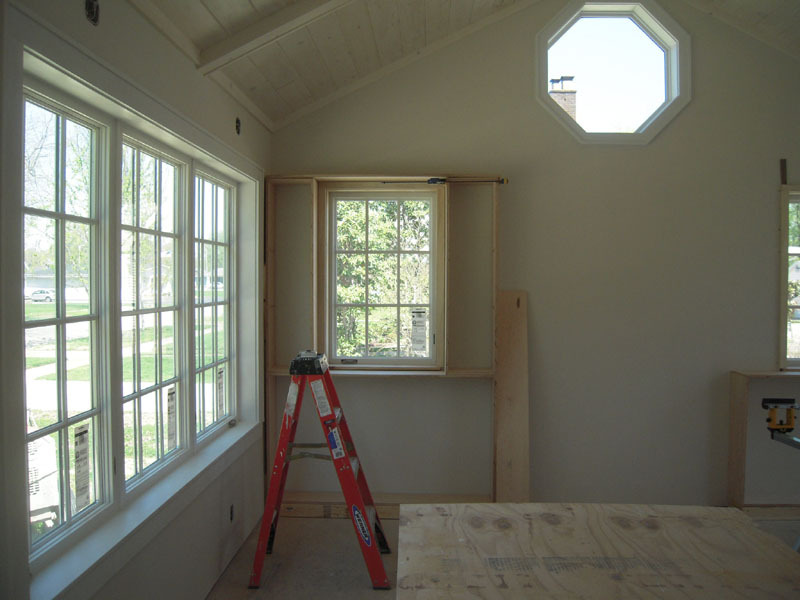 The wall sconces were placed to correspond to the windows. Unfortunately, this left an awkward gap between the lights. You can see I’m fiddling with a cardboard design to balance out the space. We’ll see how this turns out. 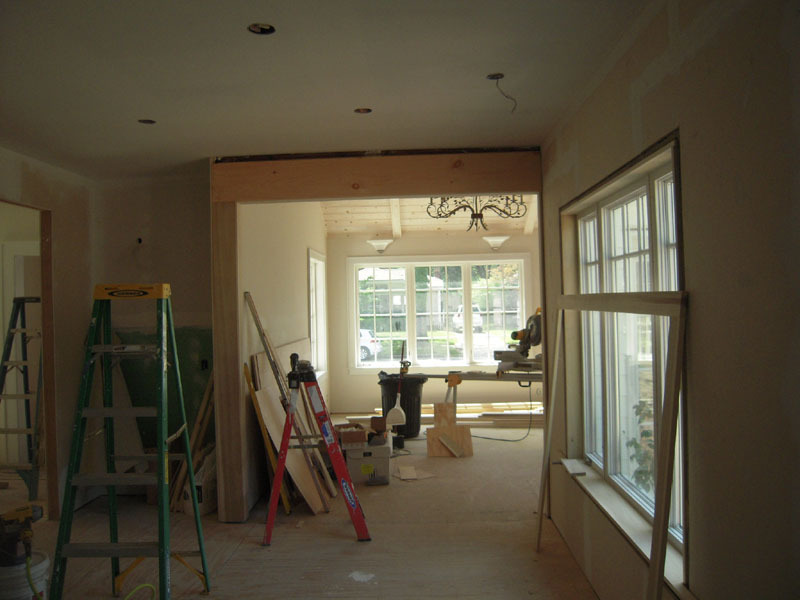 This is a view from the kitchen into the sunroom. I’m casing the last window and one of the final door openings. 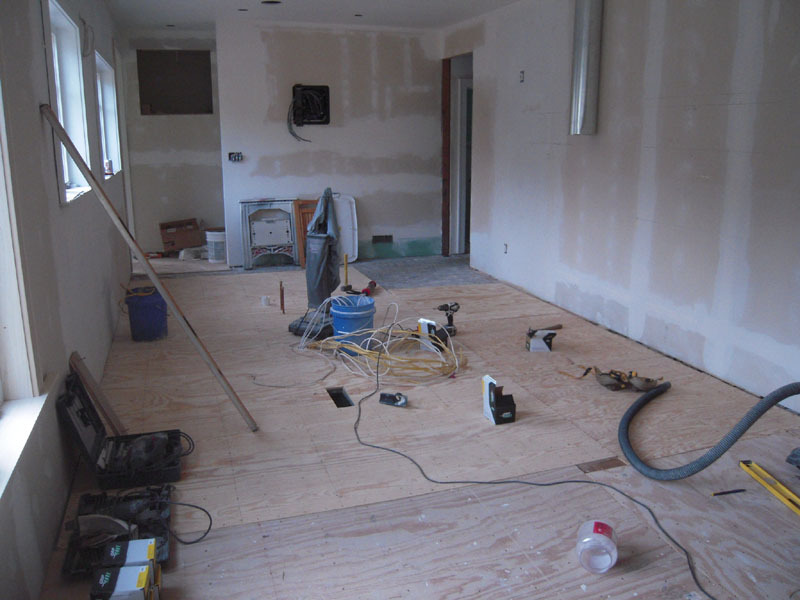 Looking back into the kitchen area you can see I’m adding a 1/2″ BC plywood underlayment, glued and screwed to the 3/4″ T&G pine floor. There is a 14′ island that runs down the middle of this space. 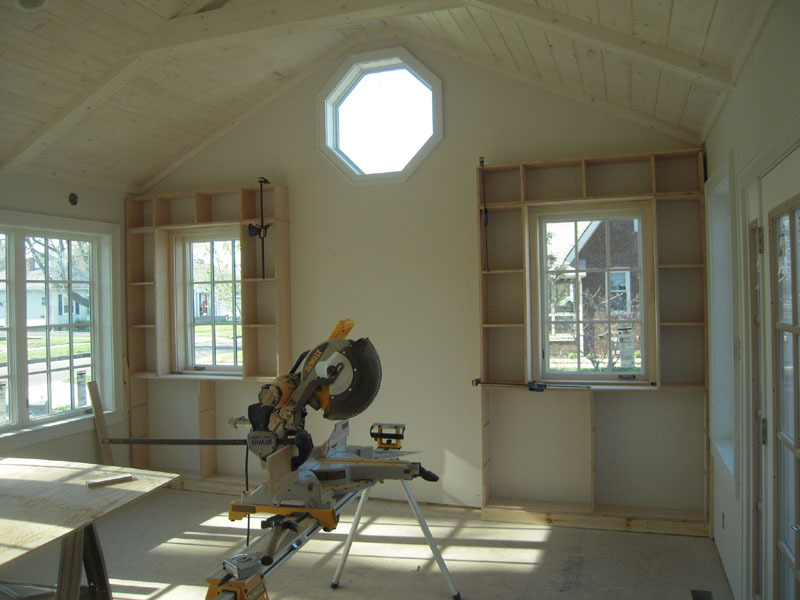 I kept two rooms with original plaster lathe walls and ceilings. 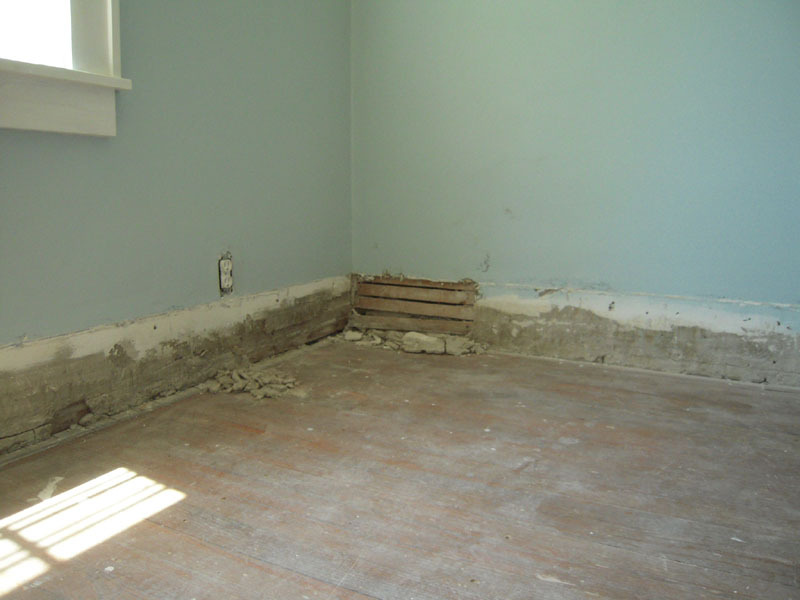 This is what was behind the baseboard. 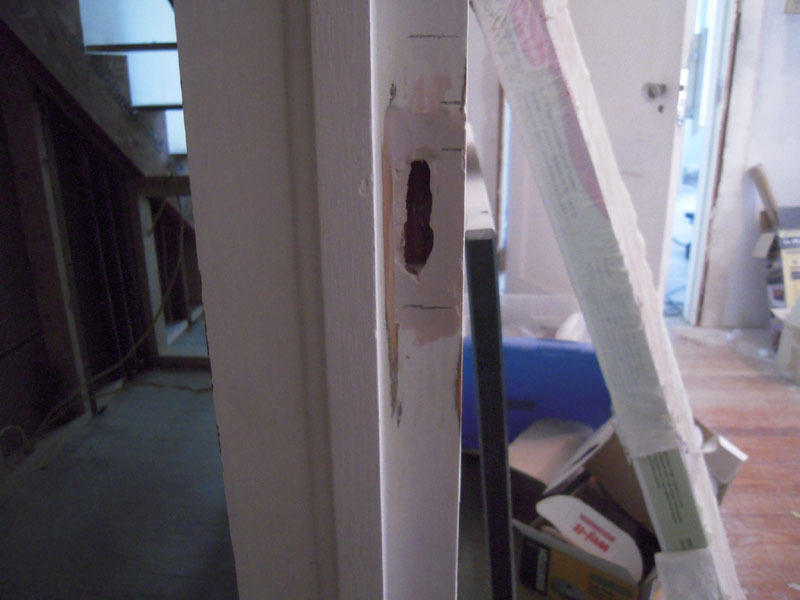 We’ll repair this before we replace the trim. 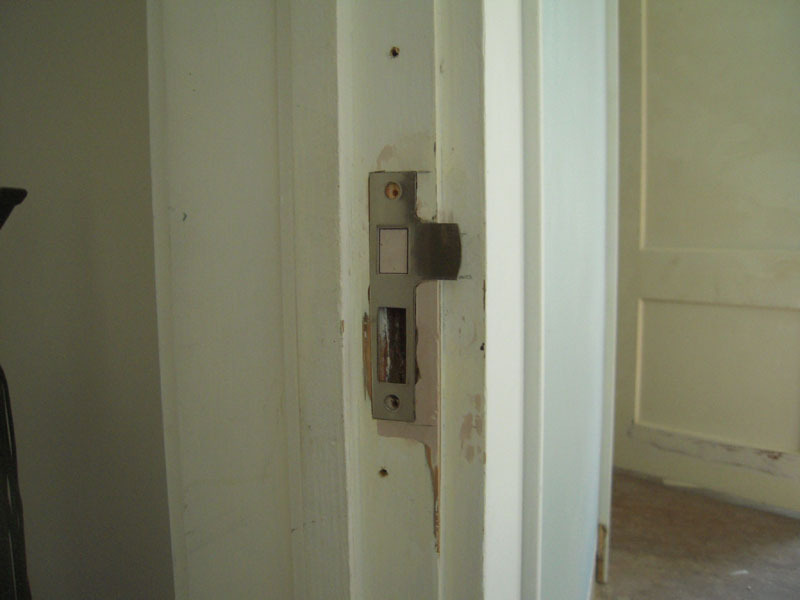 All the doors get new hinges, mortise locks, plates and knobs. So of course the new door strikes don’t fit the originals. First I use auto bondo to fill in the areas that would show with the new striker plate. The pencil marks show the new location. 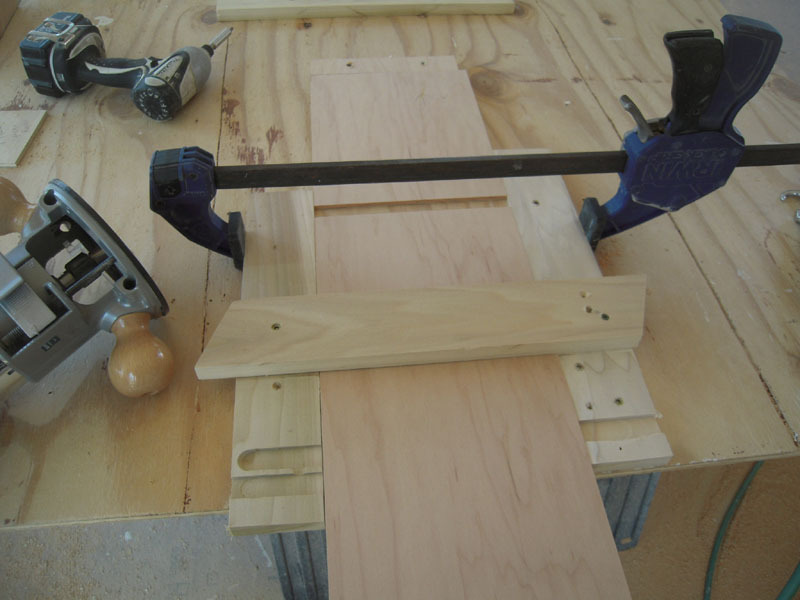 As usual, I made a jig that will make a fast and accurate cut to recess the plate. The jig has a piece that fits against the door stop. 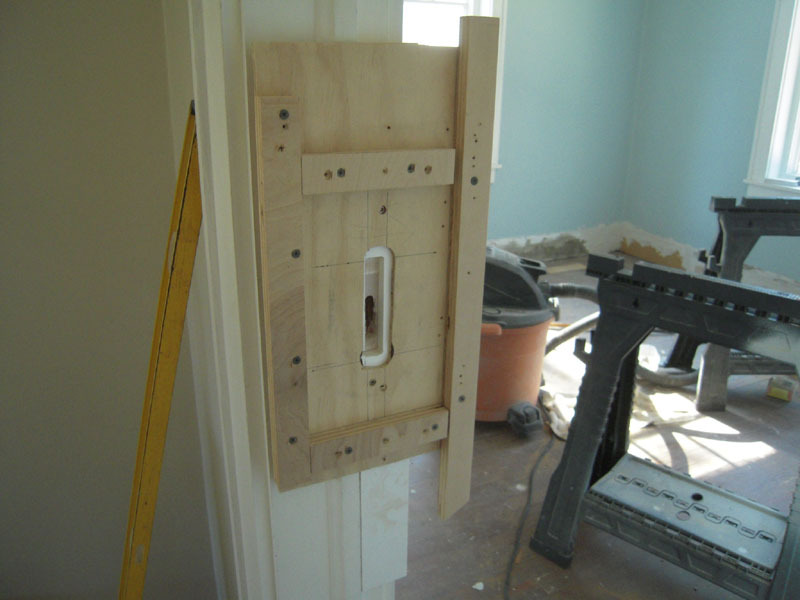 It is then screwed to the jamb so it won’t move. 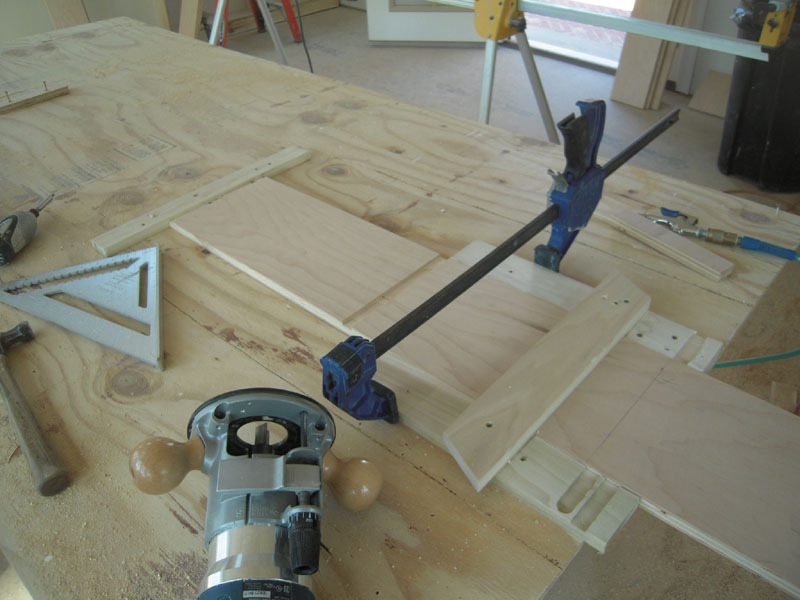 The router uses the jig frame to make an accurate cut for the recess. 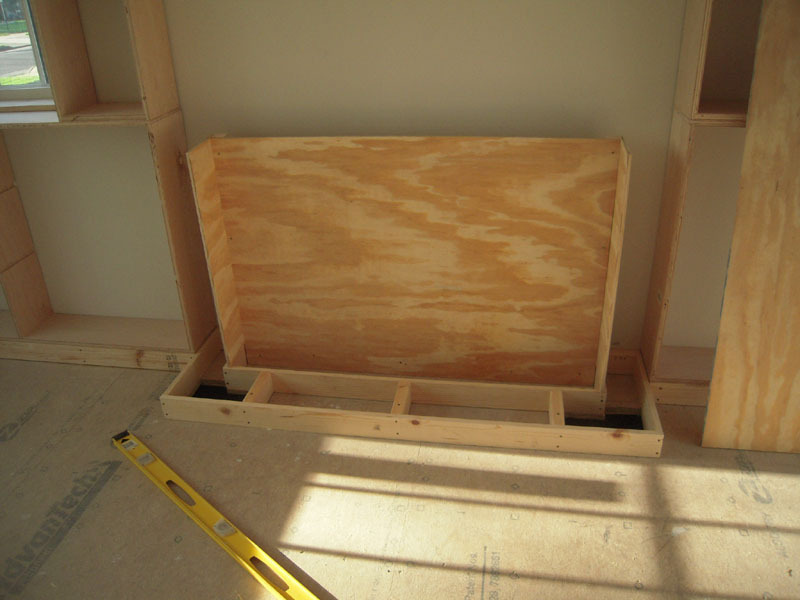 The test fit shows I didn’t get enough filler to cover the old hole. We’ll add a little more later. 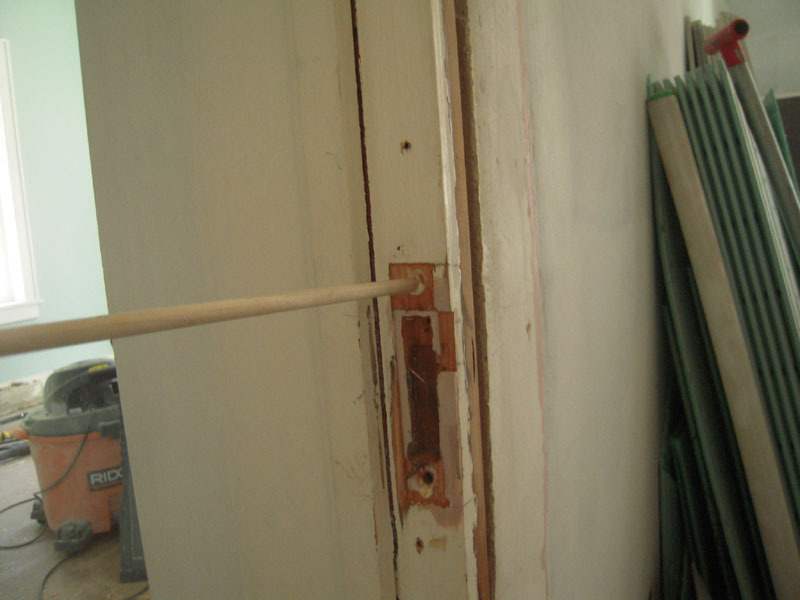 The jamb is marked for the latch hole that needs to be mortised. 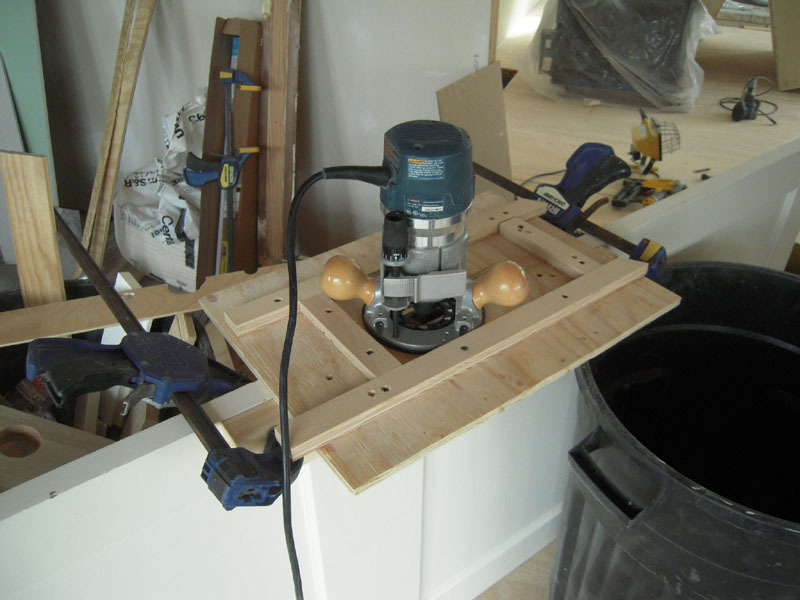 Make a couple holes with a forstner bit. This type of drill bit makes a flat bottomed hole. 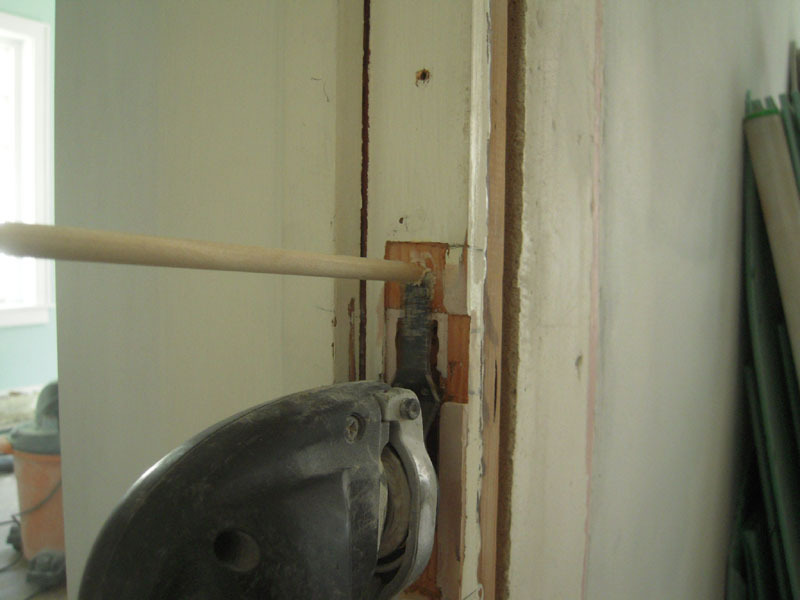 Then just use a wood chisel to square up the hole. 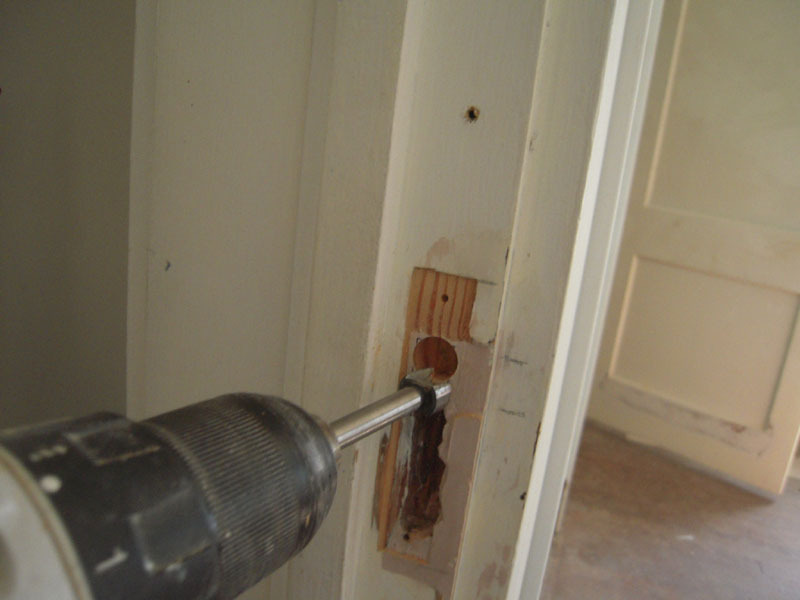 I usually fill the old screw holes anytime I replace a plate or hinge. Take a small diameter forstner bit and dill into the screw hole. 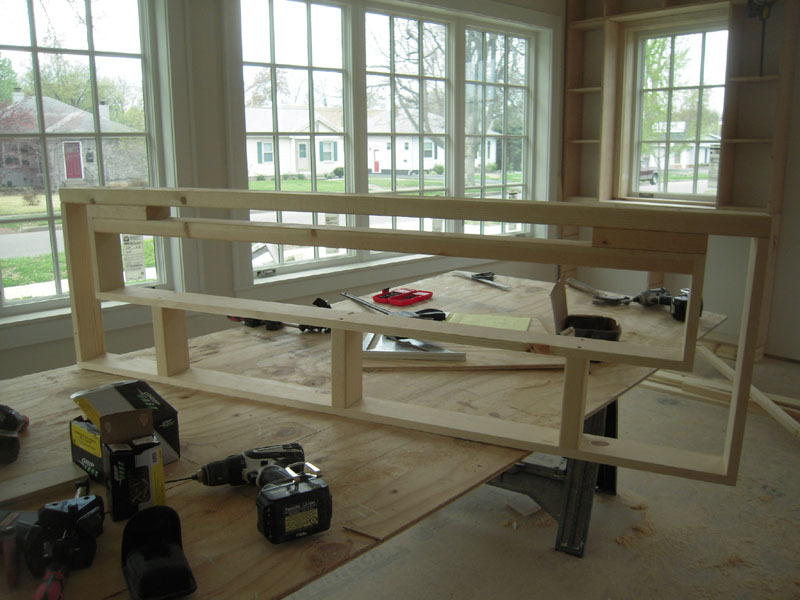 Take a matching diameter wood dowel and glue it in place. After the glue is dry, saw off flush. 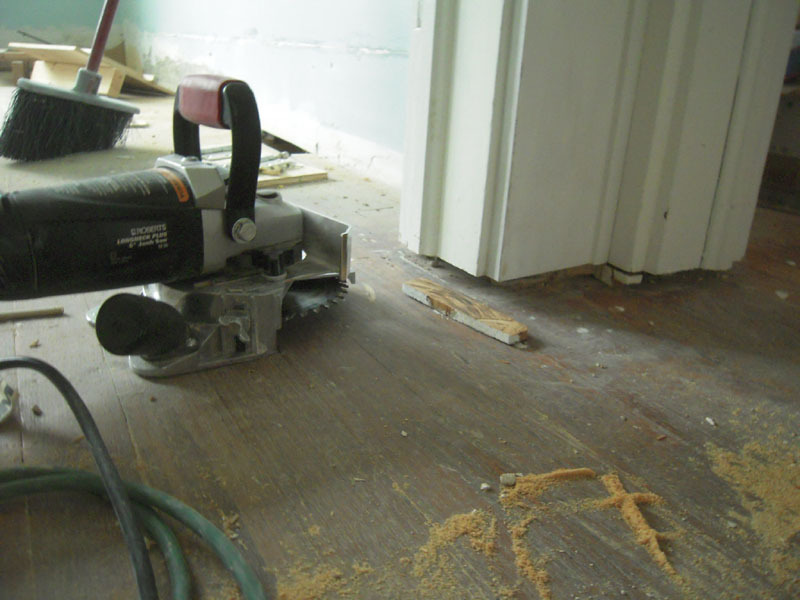 This not only gives you a clean start, but reinforces the wood around the original hole. 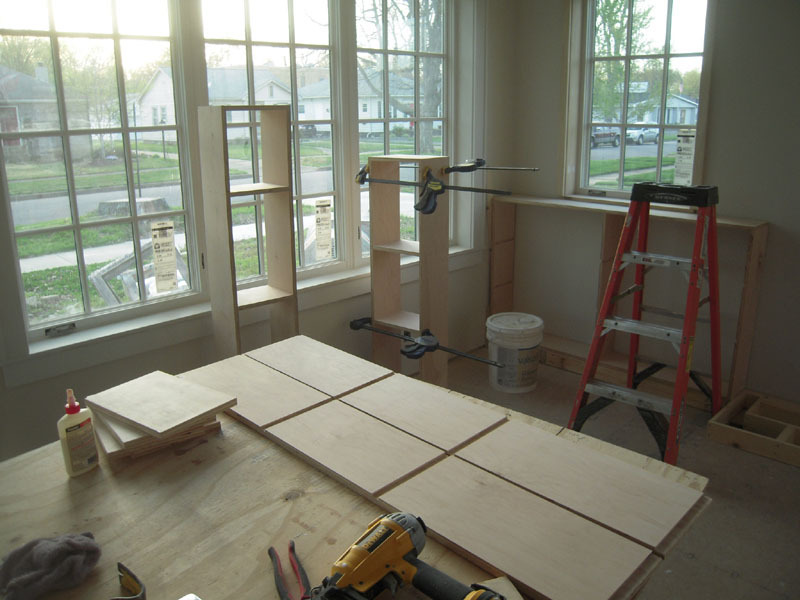 To get the 1/2″ plywood under the trim, I rented a jamb saw to make the cuts. 20.00 for 4 hours rental. Had all the doors cut and the tool back to Home Depot in an hour. 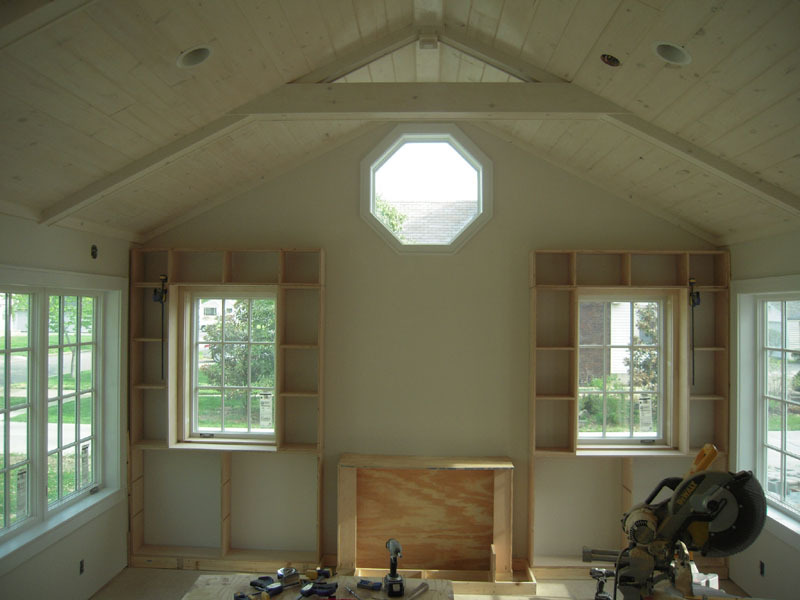 This project would have taken all day with a regular saw. 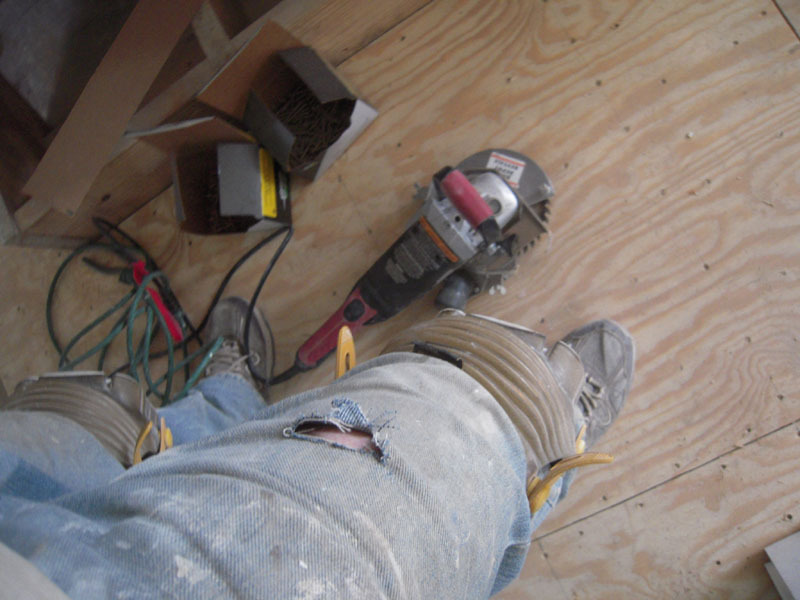 But I dodged another bullet – while I was handling the still spinning saw I nearly snagged my leg. It ripped my jeans but didn’t get any skin. Lucky this time. Hope everyone is having a great and productive summer. Till next time. I’ve got lots going on here at Misadventures. 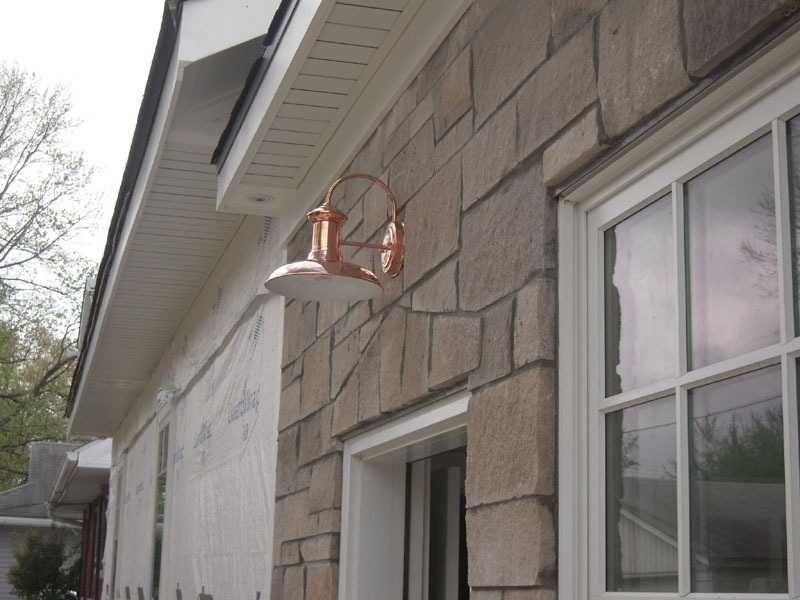 Finishing up soffits and Azek trim on the stone work. Rough plumbing is in the woman cave. New roof goes on next week. 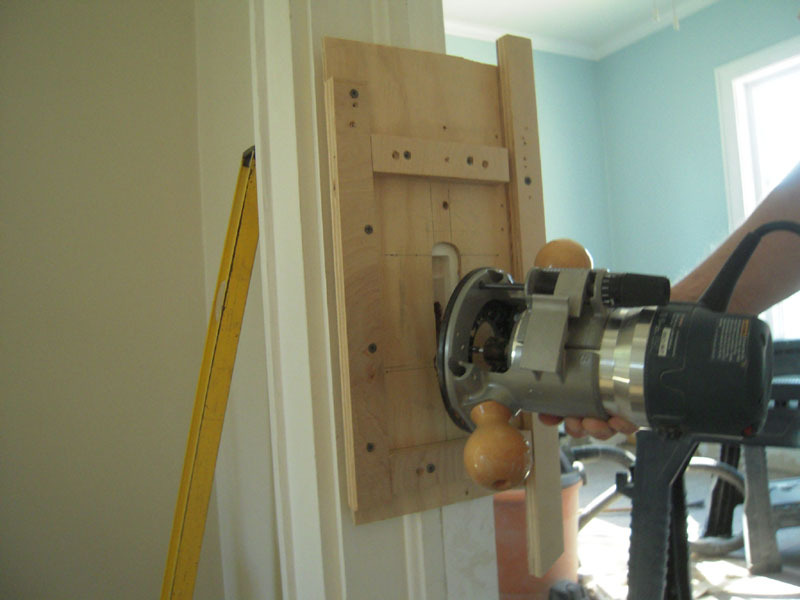 Today I’ll do a quick post about original doors and mortises. I’m using the original doors in their original locations when possible. Really, there’s only five doors on the first floor that stay where they were 80 years ago, but the original mortise latches and locks were broken and others didn’t work very well. So, to make it more complicated I got new latches and hinges for the doors. 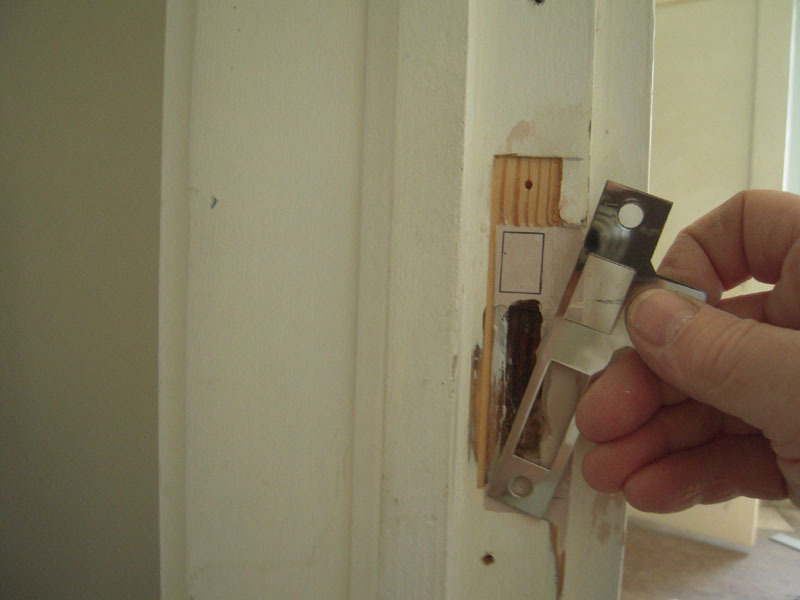 The problem is the new latches won’t fit the original openings. Great! 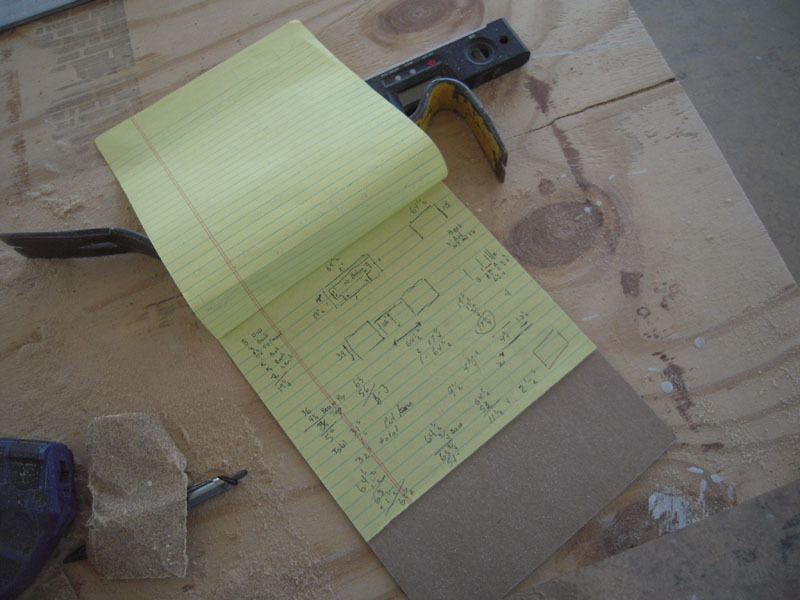 Time to make a jig! 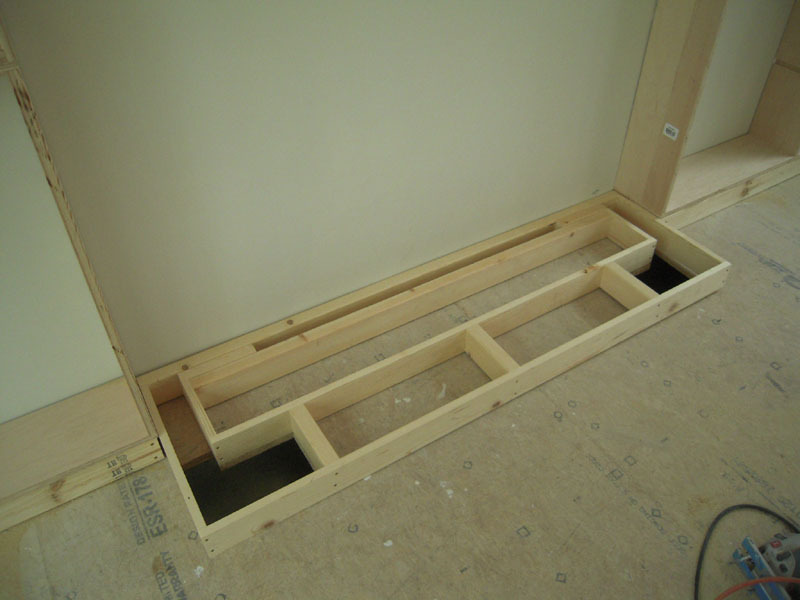 So using the handy router bit to base plate edge blocks, I made a jig to route the new openings in the doors. Since I have five of these to do it was quicker to make a jig. 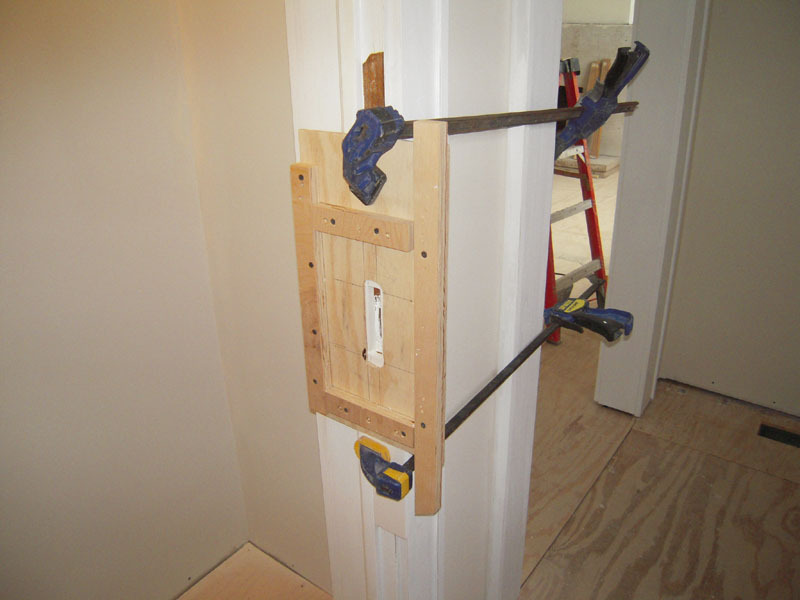 The jig is aligned to the opening and clamped to the door. 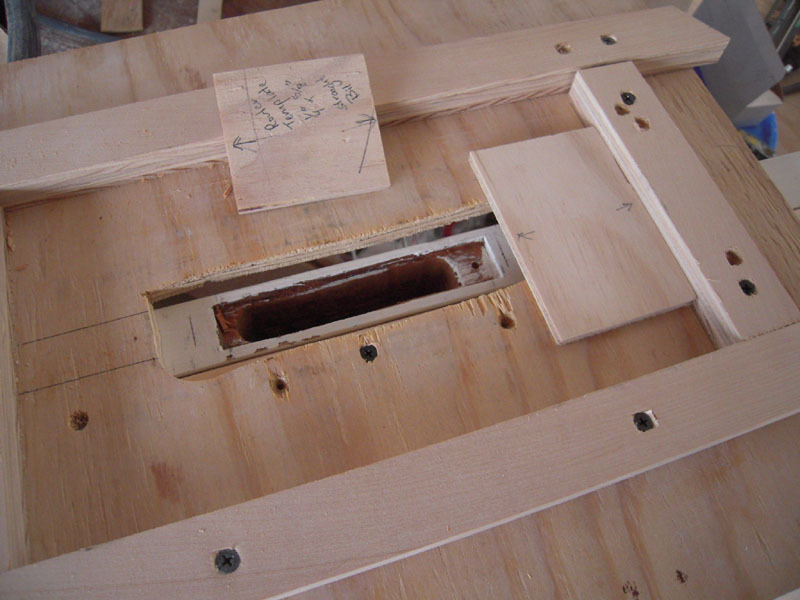 The router base follows the frame to cut the new opening. 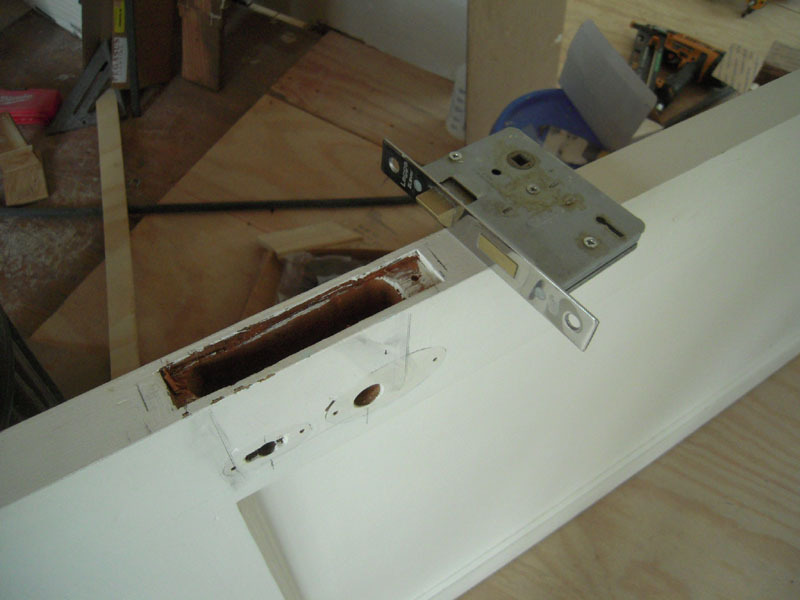 And the new latch fits into the new recessed opening. 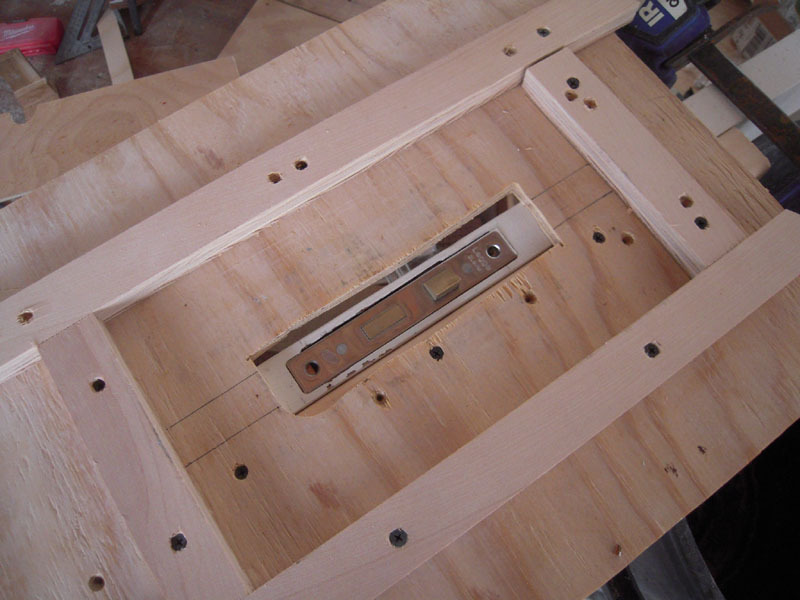 Of course, the strike plates didn’t fit either, so another jig is made for the door jamb. The router follows the inside frame and you have just what you need. 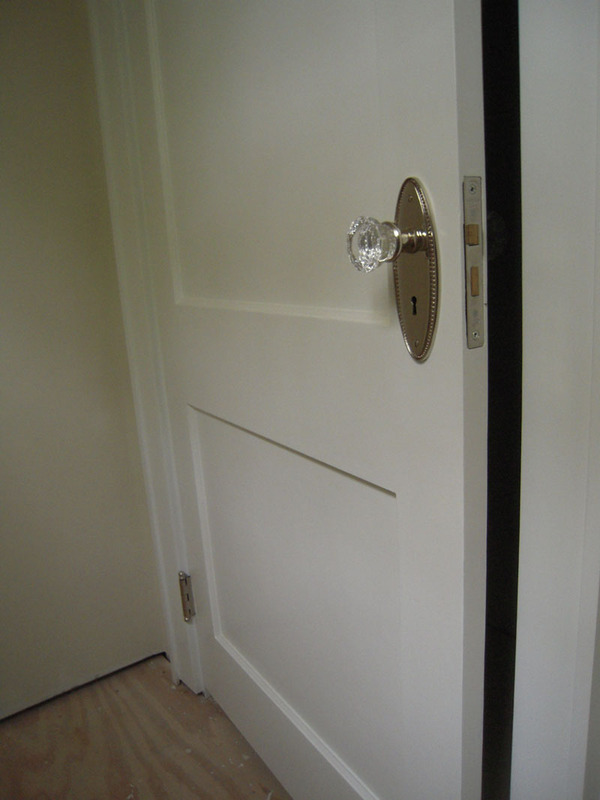 The reconditioned door with new latch, door plates, knobs and hinges – one down, four to go. 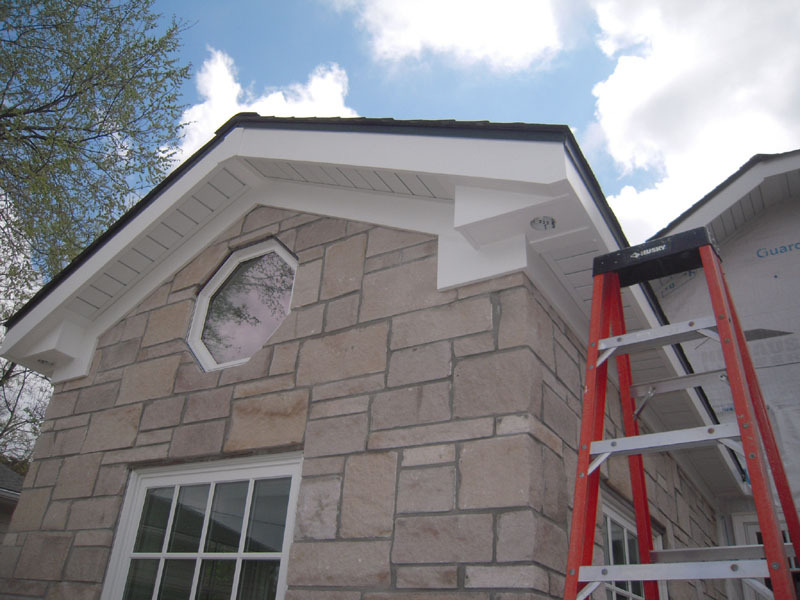 When it’s not raining I’ll jump outside to finish the Azek frieze trim and soffits. This was the last of the hidden vent soffits around the whole house. No more birds nesting in there! And while I was at it, I added this nifty solid copper light over the back door. This should get a nice patina over time. 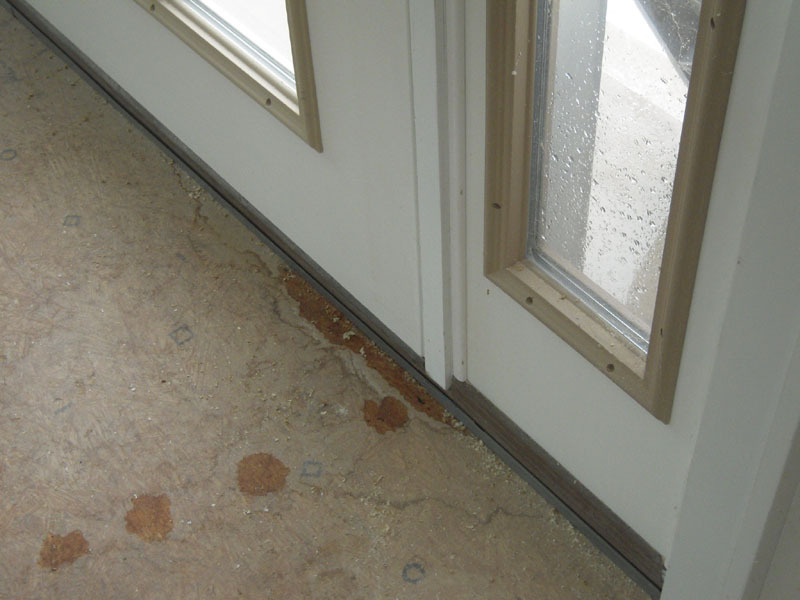 One problem that had me stumped was this little leak at the sunroom door. 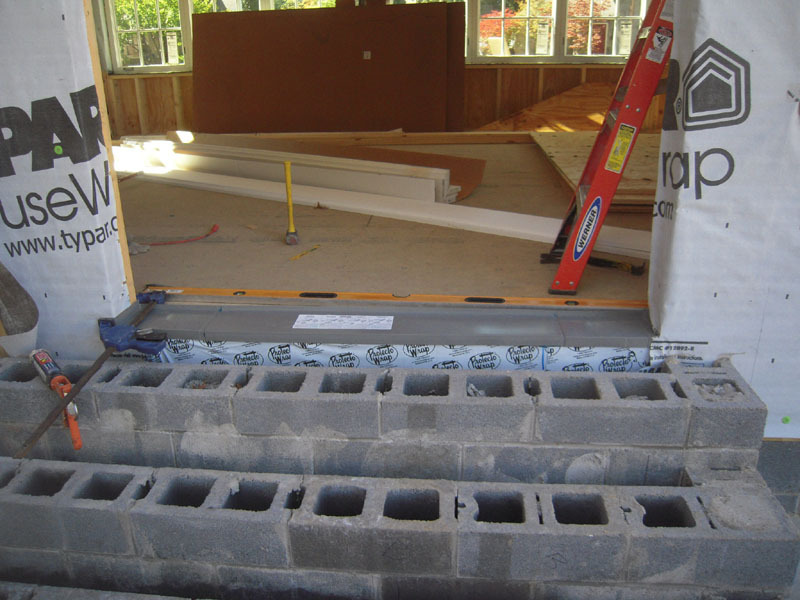 There’s no gutters on the house yet, but no leaks should be happening here.It has a sill pan underneath. 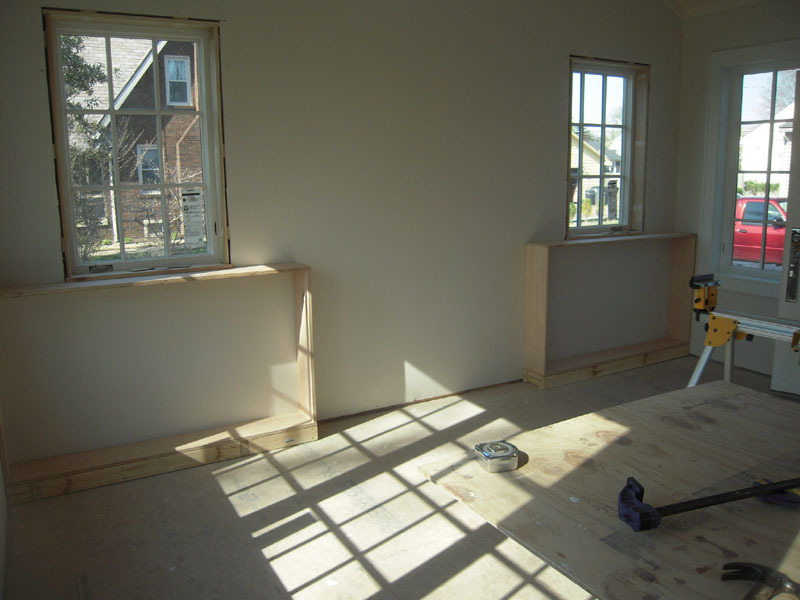 As you can see from this photo in 2012, the sill is protected with a pan and flashing underneath. After taking the brick-mold off outside and my newly installed trim off the inside, I was ready to remove the door and see what could be the problem. But before I dropped the door, I thought I would see if it was possible that the pan was leaking. These sill pans are made from three pieces that are cemented together, so I took a syringe and filled the pan with water. It leaked. So I ordered a can of Weldon 2007 – a water thin pvc solvent. 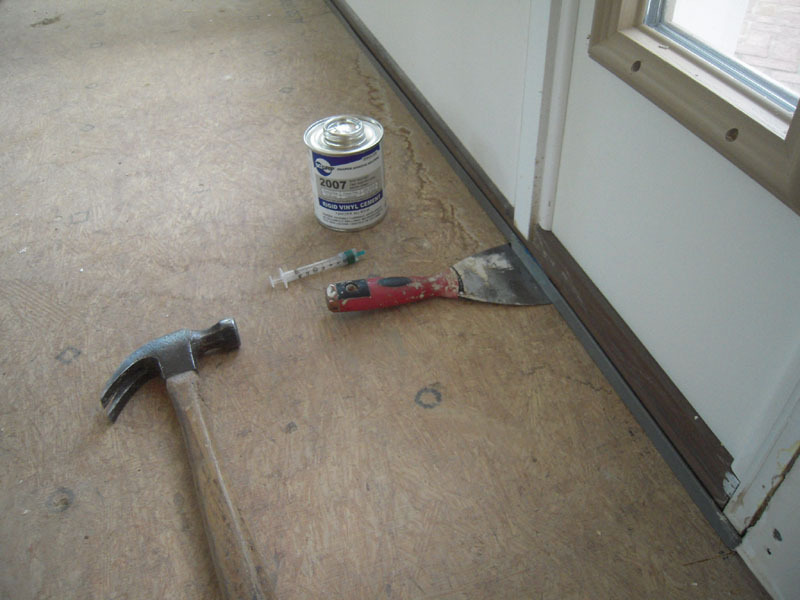 I used the syringe to add cement at the seam inside the pan and then applied upward pressure with the putty knife between the floor and pan. It took care of the leak. Wish I would have thought of this before I took off all the trim. Live and learn.